Except on the night of 20/21 January, which was the month’s last diamond dust night in Rovaniemi. During the day, when driving in the city, we paid attention to Fairbanksian amber, a beautiful yellow glow in the sun direction that can be seen in cold weather and with which we became familiar on the successful halo expedition to Fairbanks in January 1996. This gave us an omen of foreboding that a night of big odd radii diamond dust was finally on the cards for Rovaniemi. Weather forecast was with us too, as the temperature was expected to drop to -33° C – the magic number that Walt Tape has given as being in the center of the temperature range favorable for odd radii. 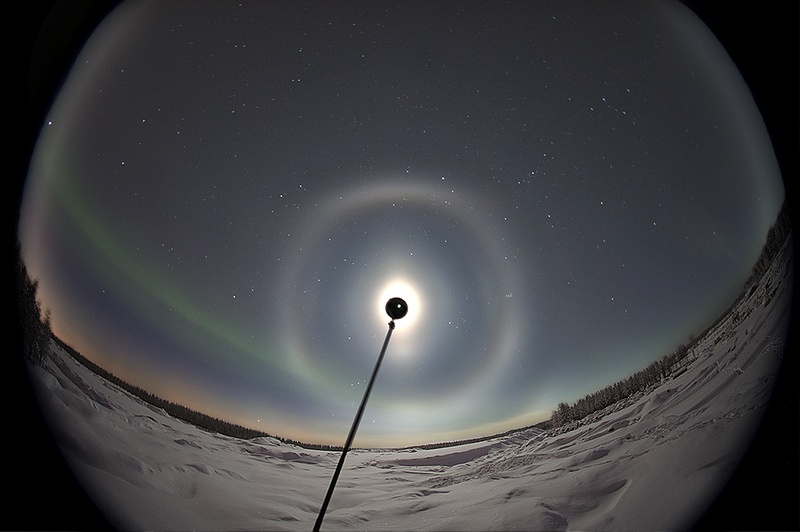 This entry was posted in diamond dust halos, moon halo, pyramidal halos and tagged odd radius halos. Bookmark the permalink. WOW just stunning! I love this display.